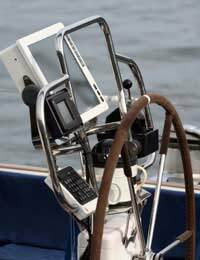 Because of technological advances in microchip technology and electronics, there are a myriad of different communication devices and systems that can help you if you’re living on a boat. For your own safety, you will want some form of communications system but the extent of that will very much be determined by the type of boating and sailing you intend doing. For example, a person who is simply living on a permanently moored houseboat on a canal or river is not as likely to need as sophisticated a communications system as somebody who’s regularly going to be cruising on the ocean. And, if you intend sailing at night, you’ll obviously require the correct combination of navigation and communications equipment. There are numerous companies who specialise in marine communications equipment and the best thing you can do is to seek out their advice. Based upon the type of boating lifestyle you intend to pursue, they will be able to advise you on the minimum equipment you’re likely to need. This article, however, will briefly describe some of the different types of marine communications equipment out there and its general purpose. GPS (Global Positioning Systems) have become increasingly popular in all forms of transport, even including your car. They are electronic receivers which can accurately pinpoint your location anywhere in the world. They do this by triangulating your position via the use of signalling beacons from satellites in the sky and they are an ideal tool for navigation. Once you enter the GPS location of a known landmark, the system recognises that location and speed you’re travelling at in order to compute the direction, distance and time it will take you to reach each point along your journey. These points are referred to as ‘waypoints’ and most devices can store anything from between 100 and 1000 waypoints. By having GPS on board, you can use it to find a particular pier or launch site or even a favourite spot to go fishing, for example. DGPS (Different Geographical Positioning Systems) have even more advanced capabilities than GPS as not only are they able to interpret information from satellites but also from coastguard beacons on land and they are even more accurate, perhaps pinpointing a location to as little as within 5 to 10 metres. Obviously, these types of devices will cost more and some will often come equipped with electronic compasses and digital maps. Some of them will obviously be bigger and be mounted somewhere in the boat. However, like most things, you may be paying out far more for something that you don’t necessarily need and a simple hand-held device may be perfectly adequate for your needs so it’s best to seek advice first. Often referred to as ‘marine band’ radios, these devices enable you to communicate with boats you can actually see. Once again, they can vary in their capabilities and it’s the height and the length of the radio antenna which will be the determining factor in establishing the range over which they’ll work. At the very least, you should have access to at least one mobile phone whatever type of boat dwelling lifestyle you prefer and ensure that you keep it charged or carry spare charged batteries for it. For long range sailing out on the open seas, the main piece of communications equipment you’ll want to have is referred to as an EPIRB. EPIRB (Emergency Position Indicating Radio Beacons) are at the ‘higher end’ of the market and automatically send out a distress signal that can be picked up by satellites if your boat is out of range of both VHF marine radios and/or you cannot get a mobile phone signal. They transmit a distress call to the likes of satellites, aircraft, rescue boats and other land based stations like the coastguard, for example, which monitor frequencies used for emergencies. Obviously, technology such as this would only really be useful for ocean faring vessels or those who are likely to travel to very remote locations. Ultimately, you can kit out your boat with communications systems which will cost you from less than a hundred pounds and run into thousands but there are plenty of experts out there who will be able to advise you on what you need for the type of boating you’ll be doing.